Over the last three month I have been using a product called Paraliminals. During these months I have experienced such benefits such as increased presence and calmness, being able to get out of negative feelings and headspaces quickly and increased focus and effectiveness. 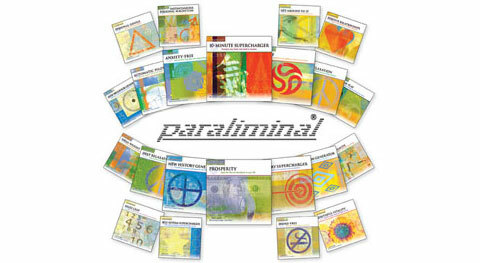 Paraliminals are CDs that are focused on various aspects of your life. One is about getting you to become more focused and effective. Other ones are focused on such things as overcoming anxiety or improving relationships, confidence and health. There are currently 34 of them. You use the Paraliminals by first reading through a few short instructions in the small booklet included with each CD. Then you just sit or lie down for about 20 minutes per Paraliminal and listen with headphones and closed eyes. Paraliminals are not subliminals with hidden messages. When you listen you will hear one voice in each ear telling your different things. One voice may for example tell you a short story while the other tells you positive affirmations. This can be a bit confusing at first as you try to follow them both and hear what they are saying. After you have used them few times you start to relax more and just let the words flow over you like waves. Even though you may just pick up snippets of what is said consciously all of it is absorbed by your mind. Some Paraliminals are divided into two sessions where the first session might be geared toward some limiting belief or behavior you have. And then the second session is about replacing that belief or behavior with something more useful for you. Paul Scheele from Learning Strategies is who youâ€™ll be hearing most often when you listen. But he also has help on some Paraliminals by top personal development people in the world like Brian Tracy and Jack Canfield. Beneath the two voices in your headphones there is usually some music and soothing background sounds like ocean waves. Beneath that is another layer with Centrepointe Research Institutes trademarked Holosync technology. Holosync uses something called binaural beats. As I understand it binaural beats means that a different frequency is heard in each ear as you listen. Your brain does however not perceive the frequencies that way. Instead it hears frequencies that aren't really there as it combines these two sounds. You can hear this as a faint hum on the CDs. Personally, I was a bit skeptical of such claims. So does it work? Presence and calmness. For about five hours to half a day after using a Paraliminal the mind becomes very calm and clear. Self-talk – positive or negative – just shuts down. This makes it very easy to be present, focused and effective. Plus, you of course feel good during that time. It doesn't work on every occasion, but about 80 percent of the time for me. I am guessing that I can up that percentage over time by becoming even more accustomed to using them. Quickly move out of negative feelings and headspaces. This is similar to the previous benefit, but something I'd like to point out since it's something most of us struggle with. Some days you feel great. On other days you do not. You may be feeling nervous or uncertain. Or just negative overall without much reason that you can think of. I have found that using a Paraliminal on one of those days can make a big difference and shift my mind from negative thoughts loops into a more positive and stable headspace where that self-talk and those nervous feelings just leave me. Enabling supercharged mental states. Yeah, that subtitle may seem a little odd. But what I mean is this: on some days you just feel like you're on top of the world. Like you're unstoppable. I have found that using Paraliminals can produce such a mental state where you for instance are almost delusionally confident. Or very laid back and relaxed. Sometimes it doesn't feel like you are quite yourself for a while. Like you are still yourself, but in a supercharged version. Creativity also seems to improve overall. New thoughts pop up and new perspectives open up. A good replacement for naps. I don't really take naps. But using a Paraliminal in the late afternoon or early evening when I become tired and unfocused always seems to refresh and clear my mind and give me a boost of energy. Here are some of my current favorites among the Paraliminals and some specific benefits I have experienced from using them. Self-Esteem Supercharger. This is maybe my number one favorite right now and I have used it probably 20+ times. Basically it creates a lot of positive feelings in me and raises self confidence, sometimes to an almost delusional level. You feel awesome about yourself. Perfect Health. This one produces the oddest benefits to so far. I have used this one to for instance stop oncoming cold symptoms like a sore throat. 20 minutes with this one and that discomfort starts to disappear over few hours time. I have also used it to reduce cold symptoms. It's not some magic cure for the common cold or other ailments. It doesn't work all the time. But maybe 70% of the time it has helped me to either stop a cold before it breaks out or to alleviate the discomfort of the cold. Focus & Concentration. This one features the famous productivity and personal development author Brian Tracy. And it has left me laser focused and excited to get things done each time I have used it. Deep Relaxation. All the Paraliminals have a relaxing effect. But this one goes a bit further. After about 35 minutes with this one – the longest of all the one-session Paraliminals – I feel really, really relaxed and self-talk is totally gone. It's a rare but very nice mental state to be in. You feel laid back and, well, cool. Get Around to It. This is another one geared towards increasing your productivity. And in this case, to snap you out of procrastination. The effect is almost like productivity on autopilot. This Paraliminal throws me into a headspace where I am eager to get started with things. As I mentioned you don't really have to do much, you just sit or lie back and listen after having read and followed the brief instructions (these instructions are usually just about what you want to focus on for this session, like for example what belief you would like to change). However, one tip that has helped me to get better results is to be present and really there while listening. If I drift away too much into other thoughts while listening I don't seem to get the same powerful effect. So I use a few simple belly breaths to draw myself back into this moment when feel that I my attention is starting to drift. I am currently using Paraliminals about 5 times a week. I will now focus a few of them and explore them further. Based on what I have experienced so far I am sure it will be a very interesting ride as I intend to more deeply explore such things as my beliefs, self-image and creativity. I'll probably do an update on that a bit further down the line. So as you understand I highly recommend Paraliminals. And it's not just me who like them. Personal development giants like Tony Robbins and – obviously – Brian Tracy and Jack Canfield endorses them too. The CDs include a 30 day money back guarantee, so there is no risk. You can just try them out and return them if you didn't find them effective. To order the Ultimate You Library click here. And if you want to order any individual Paraliminals click here. I still don't think there are any magic pills when it comes to personal development. You have to do the work yourself. But Paraliminals sure makes that work a lot easier.